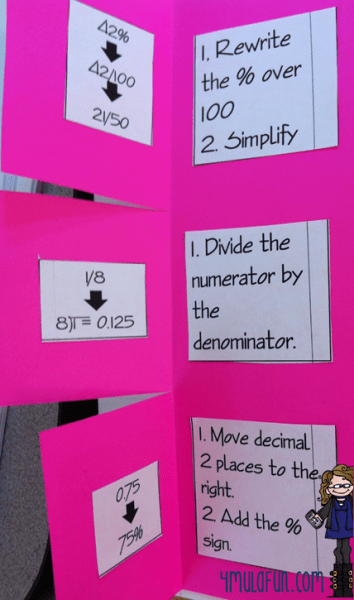 If you are searching for a fun way to teach , decimals, and percents, this foldable is a must for your classroom! 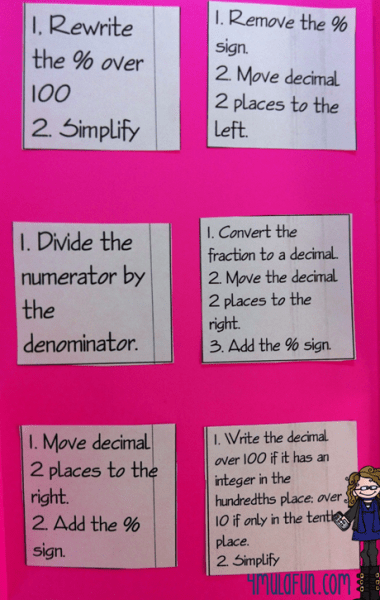 Last week in my class, my regular students worked on creating a flippable for the different types of rational number conversions (Fractions, Decimals and Percents). I knew that I was going to be doing the same activity this week with my Resource Math students. I needed something that wouldn’t take up the entire class period so this weekend, I was on a mission! I knew that the flippable that we created above, while cute and pleasing to the eye, would take forever with my other classes. I was worried they would lose interest in the writing. So, I helped them out a bit! 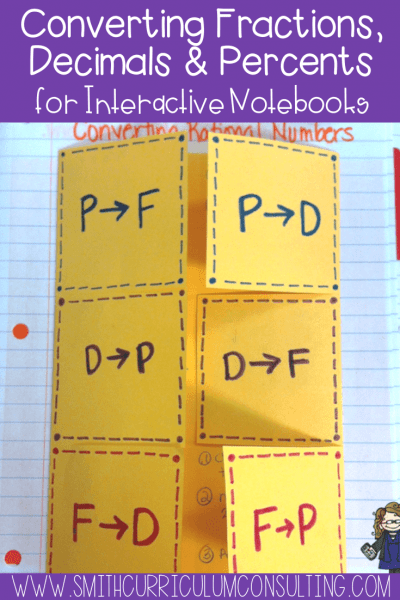 I typed up all the notes and created an easy template for the flippable and we were ready to go! As you can see, not only is it neater when it is all typed out, but I was able to work with my students on a more 1-on-1 basis. I started by having them find all the labels they cut out. Then we glued them on the outside of the flippable. We then went through and pulled out the directions. With the flippable closed to show the labels, they had to pick which direction went with each label. We glued those on the inside. Now once we were done with that, I close it up again and then we went through with each example. Since I love how this one turned out, I started working on a 4-part flippable as well for next week! 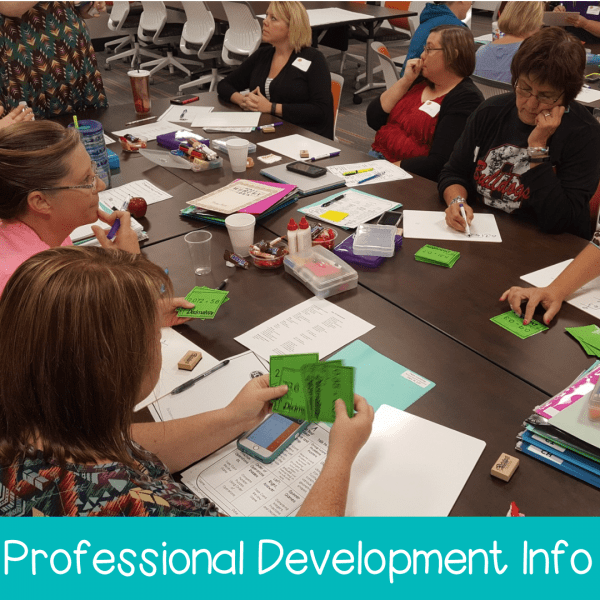 You can grab my Flippable Templates and create your own for your class as well. The sky is truly the limit! And if you are looking for the amazing color paper I used above, you can find Firecracker Fuchsia available here. Don’t Miss Out On This Flippable! 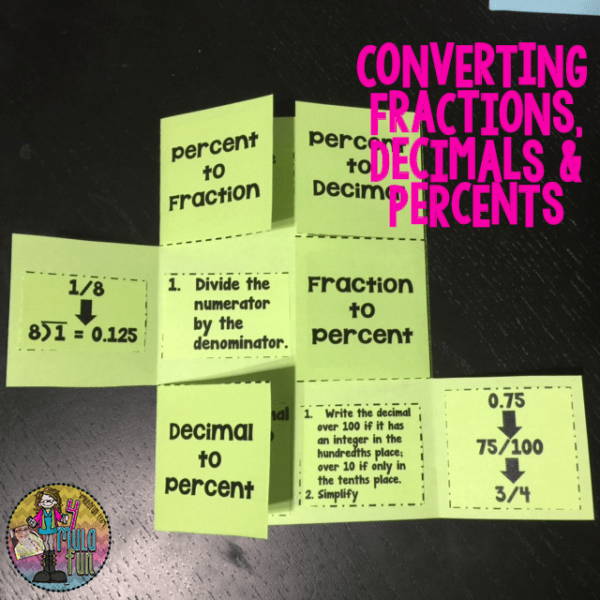 If you are interested in the actual typed out information that I created for the Converting Fractions, Decimals and Percents Flippable, please feel free to check those out in my TpT store. 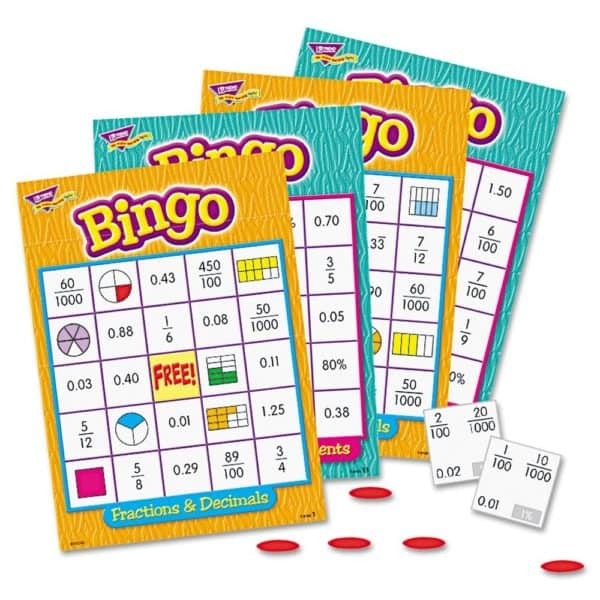 And if your students are needing more assistance with Fractions, Decimals and Percents conversions how about picking up this bingo game to play in class? Students won’t feel like they are working because you are making it fun and exciting! I hope you are having a wonderful day and I will be back tomorrow to share with you a walk-through my classroom with tons of pictures! you are AMAZING! Your student are so lucky to have you!!!! This is fantastic. Thanks so much for sharing. 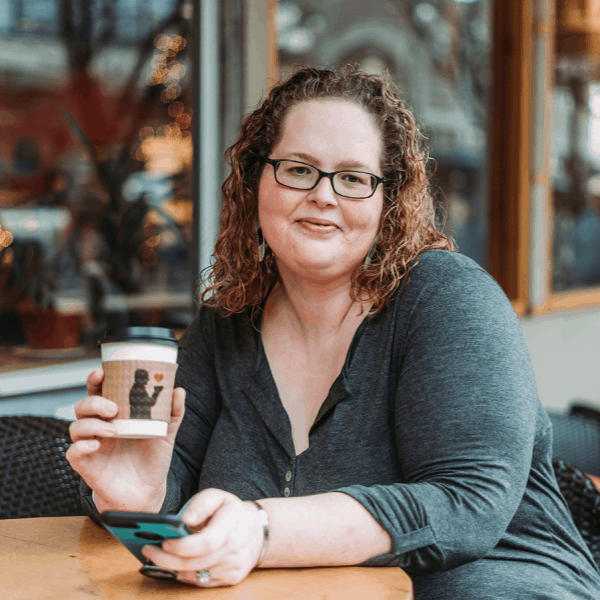 I could have saved so much time this week if I had read this post earlier in the week… 🙂 Great job! I would like to use your template but I do not see where I can get it. Is it possible that you can email it to me? Than you for bringing this to my attention. I have gone in and corrected the link. I will have the Operations with Integers Flippable loaded tomorrow! I have looked and looked at can’t seem to find it. I am teaching Percent Proportions right now, and need to Re-TEACH FDP conversions. What am I missing? what grade level did you use this for? 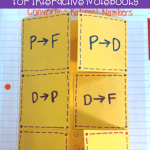 I used this with 7th grade students for review as well as 7th & 8th grade Resource Math students for instruction as they were typically working below grade level. This was great! I used this with 7th graders to front-load a resource. We will discuss each conversation in the following lesson. I used bright paper for the foldable and white paper for the directions and examples. I loved the idea of having the students find where which labels the directions and examples belonged to. I did not give students glue sticks until we confirmed as a class where each example and direction should go. We finished the foldable in one class. I love hearing how you used this flippable in your class. I am so happy to hear that it was beneficial for your students. I hope you are able to use more of my flippables as time goes on. Wow. I’m a new Special Reading and Math Teacher. I’m working on assessments and how I can make them enjoyable and fun too. I love this concept and foldable. Awesome work! Perfect practice for our decimal, percent Unit. Thank you! Thank you so much. I can’t wait to use this! Starting this unit this week.